If You're Headed to Tirthan, Make Sure You Include Thachi Valley in Your Itinerary. Thachi Valley is a little known valley in the unexplored parts of Himachal Pradesh. Situated at the heart of the state, Thachi is perched between the mountains that overlook the Great Himalayan National Park. The valley is a criss-cross of river streams and waterfalls that support lush grasslands and terraced farms. It’s replete with abundant forests in the summer and layered in snow during winter. 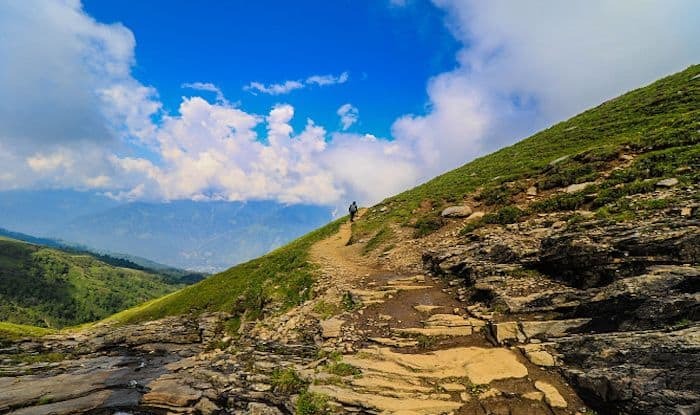 When in Thachi you can trek to a number of places such as: Hadima Peak, Bithu Narayan Temple, Ashu Alli ater stream, Hidamba Temple, Chanjwala Temple Peak, Saponidhar Grassland, Gharsaw Grassland, Gaun Beed Waterfall and Ropa Pond. En route, you can stop at vantage points to take in stunning views, interact with local shepherds and farmers. An ideal way to wrap up your stay here is to spend the night in tents surrounded by Deodhar trees and apple orchards. Imagine sleeping under the blanket of stars and waking up to surreal sunrises – Thachi Valley is a paradise in the truest sense of the word. Before you turn in for the night, you can cook heart meals with your loved ones and share stories around a bonfire with fellow travellers. If you get an opportunity to visit Thachi, consider yourself lucky. Not many people know about it, people who’re usually on their way to Tirthan chance upon it. It’s rather offbeat; being just a small hamlet near Mandi, located at 3000 meters above sea level. #thachi spend some time with nature. There are treks you can choose from depending on the level of difficulty and the number of days you have to spare. Remember to interact with the locals here – they lead a simple life and will welcome you happily to observe and be part of their local customs, food habits, beliefs and festivals. There are many other festivals that are celebrated here that mark the end of winter and welcome spring in all its fervour. If you wish to experience snowfall, the best time to visit would be from December to January. To catch flowers in full bloom, visit from June to July, and to enjoy cascading waterfalls and meandering streams, you can literally go any time of the year. Thachi Valley is about 488km from Delhi, 96km from Manali and 34km from Tirthan.